Q. One of my friends asked me why I have to go to a priest to confess my sins when God already knows what I’ve done. Why can’t I go to Him directly? And she also wanted to know how 10 or 20 Hail Mary’s are going to save me? I wasn’t sure how to answer, so I just said that’s what we believe. What should I have said? A. I’d say your answer is a good start! Allow me to offer a few brief thoughts. The first thing to consider is whether or not it is good to go directly to God when we confess our sins. This is most certainly a good idea. In fact, it has always been recommended as a good daily practice just before bed. So I definitely recommend that you examine your day each night and thank God for the good things and ask forgiveness for any sins. Going directly to God each night will undoubtedly help you to grow closer to Him. But, as Catholics, we also believe that it is essential to regularly confess our sins to God through the ministry of priests. 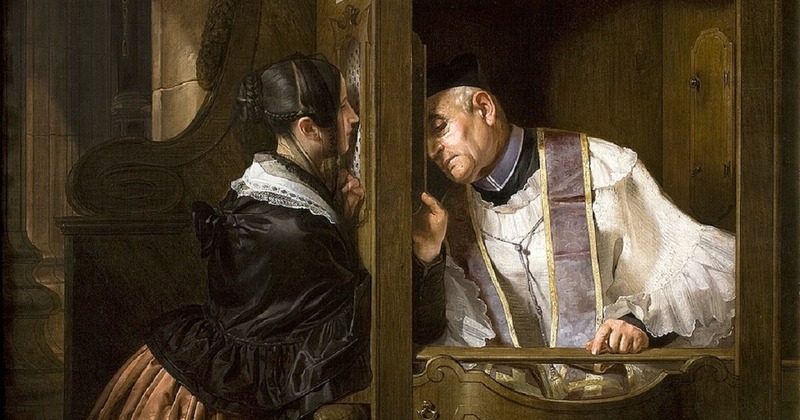 In other words, we believe that when we go to confession and confess our sins we are actually seeking God’s forgiveness, not just the priests. The priest stands as the minister of this wonderful gift of forgiveness. So why do we do this? For one simple reason. Because we believe it’s what God wants. You may recall in John’s Gospel, chapter 20, that Jesus bestowed the Holy Spirit upon his first bishops, the Apostles, and told them, “who’s sins you forgive they are forgiven them.” Why would Jesus give the Apostles such an incredible ability if He did not want them to use it? Most certainly He had something important in mind when He said this. Jesus’ words and actions always have great significance. By commissioning His Apostles to go and forgive sins we understand that this is the ordinary way that Jesus wants to continue to bestow His forgiveness upon us all. And He did not intend this only for them. Rather, we can see in the Acts of the Apostles and from the earliest times of the Church that this sacred power was passed on from these first Apostles to others. It was passed on to new bishops as well as those who assisted the bishops in the early Church, the priests. So it’s essential that we, as followers of Jesus, be open to His gift of forgiveness in the way that He chooses to give it to us. Since He is the source of forgiveness, He can choose how to give that gift to us. As for 10 or 20 Hail Mary’s, I assume this is a reference to the penance that priests may give after confession. This is a wonderful practice to help us realize that just because we have been forgiven we have most likely not completely conquered our attraction to sin again. We need continued prayer and penance to do this. So whatever penance a priest gives is intended to help the person overcome future tendencies to sin in the same way again. So what should you have said? I think your answer was good in that it is difficult sometimes to give accurate answers to all the different questions that arise in our life of faith. When you are not sure what to say then it may be best to simply say, “this is what we believe.” But when this happens you are given a great opportunity to look deeper into the question so that you can have a better understanding of why you believe what you do.